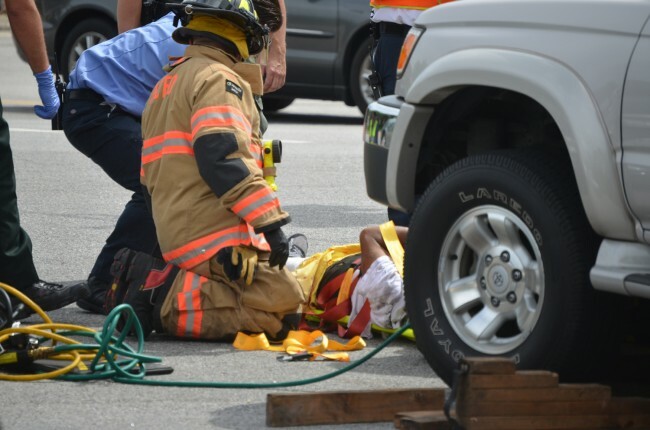 A 76-year-old cyclist riding up Belle Terre late Wednesday morning was struck by an SUV and pinned under the car until paramedics were able to lift the car, tend to him and evacuate him by air. 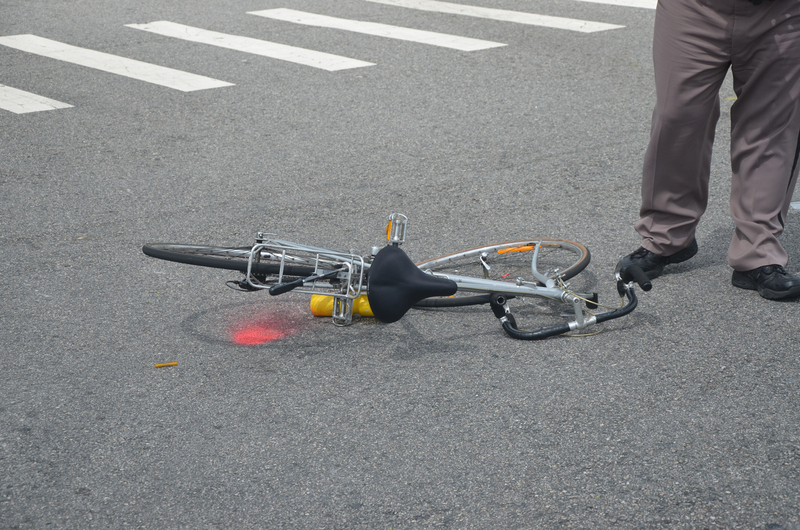 The cyclist had traumatic injuries, but was alive when he was taken away from the scene. Blood spots were visible beneath the right-front wheel of the Toyota SUV. 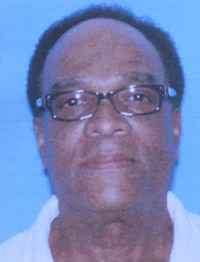 The victim is Calvin Pinero of Palm Coast. 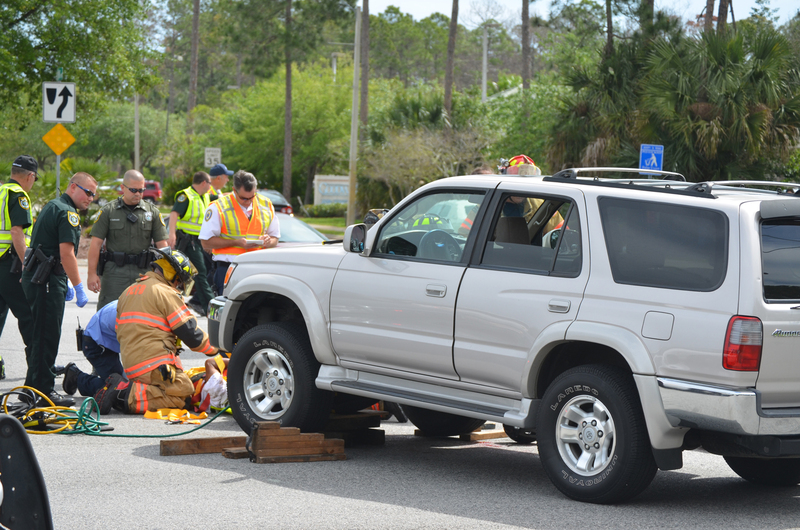 The driver of the SUV is Antoinette Mary Ulmer, 67, of Palm Coast. She was not at fault, a Florida Highway Patrol investigator said. The wreck took place at 10:45 at the intersection of Cypress Point Parkway and Belle Terre, closing that stretch of Belle Terre (southbound) from Palm Coast Parkway. 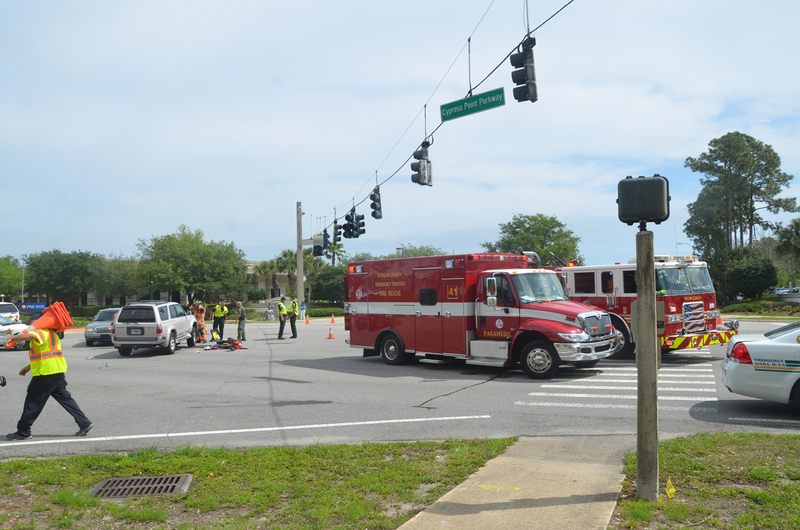 The segment of road, in the heart of Palm Coast, remained closed until 11:35 a.m. as a Florida Highway Patrol investigator works the scene. 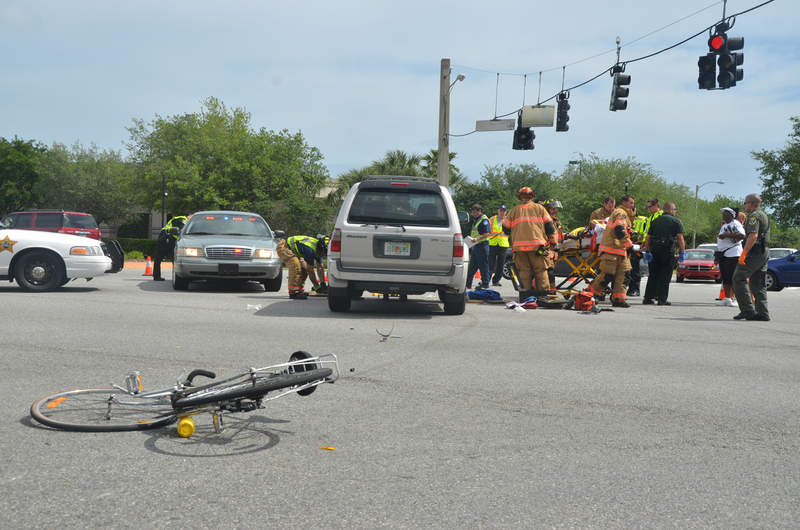 The cyclist was taken away from the scene at 11:22 by ambulance, to Flagler County Fire Flight, for evacuation to Halifax hospital in Daytona Beach. 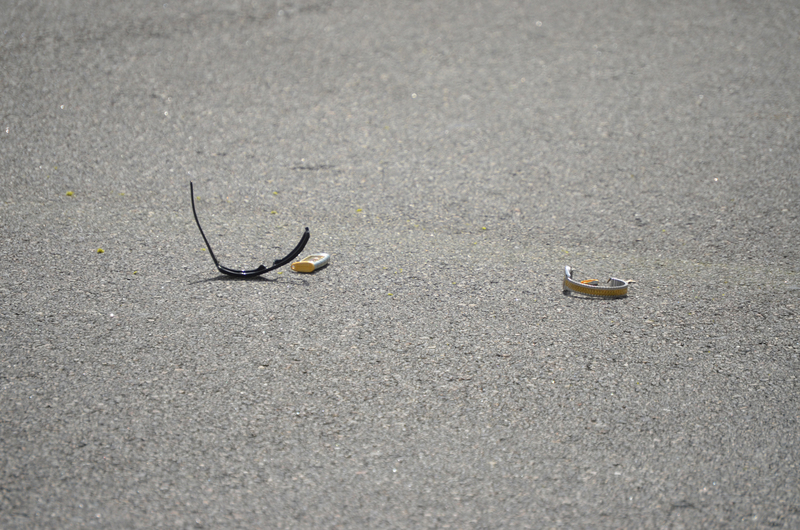 Fire Flight’s landing zone was Cypress Edge Drive, around the city hall offices. The drive was of course closed to traffic during the landing and take-off. “He’s supposed to yield,” the investigator said of Pinero, who suffered “a severe leg injury,” but is expected to survive. 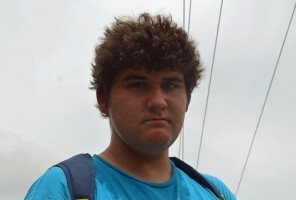 Jonathan Shepard, a 16-year-old student at Flagler Institute of Technology, was riding his own bike, going south on Belle Terre, oppisite the same side as Pinero, who was riding north. Shepard stopped at the intersection with Cypress Point. He was listening to music and said he was “in my own little world,” but he remembers seeing the pedestrian sign being red, not white. He then saw Pinero edge into the road, and the driver of the SUV begin to make her turn, left onto Belle Terre, from the driveway that leads to the Kangaroo station. Pinero’s shades and watch had fallen at the point of collision, about six feet past the walking stripes. The wreck was the latest in a series of accidents in Palm Coast or Flagler County this year involving cyclist or bicyclists, four of whom were killed. Hate to say it, but it sounds as if the cyclist wasn’t obeying the rules of the road in this case. I could be wrong. Bicycles are considered motor vehicles and must abide to all the laws of the roads. Also, please wear a bike helmet. Perhaps bicyclist should be required to take a road test and carry a license, just like motorist. Speedy recovery Calvin Pinero. Good job to all the emergency responders who took care of this man. Glad we have them all. Prayers to Mr. Pinero for a speedy recovery. Also, to MS Ulmer, hope she does well after going through such an emotional experience. If Mr. Ponero was at fault as it appears he was, please don’t persecute him on here. His injuries are more than enough to suffer for making a mistake. Thanks for your comment Bunnell Resident. The last part says it all. Is also a case of looking both sides before a driver proceeds even with green light. I do it all the time to make sure that an unexpected pedestrian, jogger, cyclist or squirrel appears in the way of my car as for sure “I always yield to them” with any color light, because they have no protection against my car. For not possessing Defensive Driver Skills. They have the skills to avoid situations like this. So let me get this straight…a vehicle runs a red light and gets involved in an accident, and it’s somehow the other driver’s complete fault just for not seeing in time that that vehicle was doing something stupid and illegal? Wow, I guess I’ll just start running red lights and if I hit someone I’ll just tell the cop that it’s the other person’s fault for not getting out of my way. That’ll get me out of a ticket for sure! Thanks! Bunnell. Great response. Some people will kick you when you’re down..